In his role as project manager at Mediacurrent, Bruce Clingan leverages his 7 years of Drupal expertise, love of site building, and educational training skills to help clients reach their desired professional goals. Bruce has dabbled in many unique professions including being a musician for the Air Force and working in criminal justice as a corrections officer. He landed in the digital marketing industry after helping a friend redefine a website design agency, LightSky. 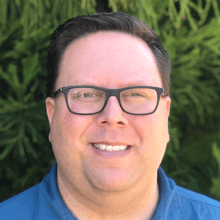 During his time at LightSky, he worked as a Project Manager, helping the company transition from a Drupal firm into a SaaS company focusing on software for nonprofits and school engagements. This began his career path in digital marketing and lead him to his role as Project Manager at Mediacurrent. Bruce is a passionate father, curler, Disney Parks fanatic and roller coaster nut who believes that the web is the most powerful tool we've ever seen. If it’s cold outside, you can find him on the curling rink, and if it's warm outside, look for him in a theme park. His passion for curling has driven him to lead a curling club and win games in a curling national championship.